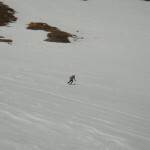 Well maybe not fluffy powder, but hard to complain for a weekday morning in mid-May. 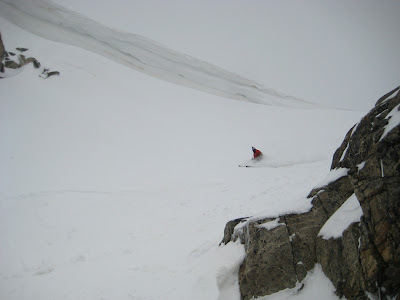 This ski season in CO (my first here) was pretty mediocre, and certainly didnt live up to any of the CO hype. 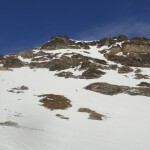 As the lifts started shutting down, the local snowpack was looking pretty grim, and plenty of folks were speculating on whether the spring season (the only reason to be a skier in CO as far as I can tell) would even happen. Luckily, mother nature has come to the rescue in a big way, delivering ample amounts of snow to the high country and occasionally in town. 1.5′ of fresh snow in RMNP was enough to convince me to shuffle my work hours around a bit and get out skiing yesterday morning. As a result of Peter’s bus not arriving in Boulder until 5:57, we made a very civilized 6AM departure, arriving at the Bear Lake TH around 7:15. 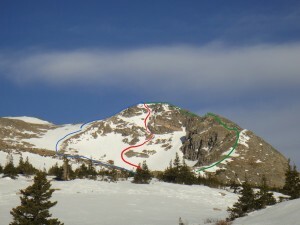 Surprisingly, the forecast clouds had broken, and we enjoyed bluebird skies to start the day. We were even a bit worried the sun was going to soften the snowpack too much. 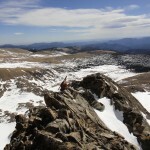 We decided to check out the south facing Dragon’s Tail couloir on Flattop Peak. If it started getting too warm, we’d just have to head down, or change objectives. As we neared the couloir, we observed that a large portion had slid the day before, leaving behind a pretty hard bed layer. 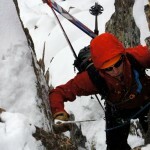 This made for great climbing conditions, but had some of us a bit worried about ski conditions. 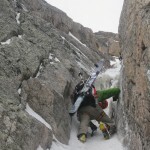 Although almost completely non-technical, the couloir does provide a very pleasant ascent, with steep rock walls and some narrow constrictions. It was hard to understand how such a trivial climb could receive so many 4 star ratings on mountainproject and summitpost, but now I can see. Climbing higher in the couloir, with increasingly variable snow conditions, I became more concerned about the safety and enjoyability of skiing it. 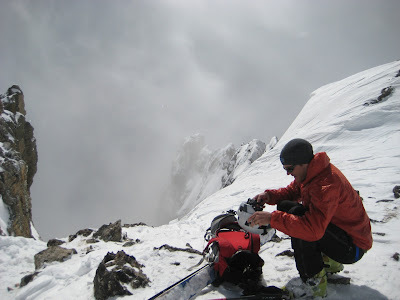 At the top, we discussed it and decided we’d rather wait to ski that line until we had more forgiving conditions. Instead, we headed over to the Corral Couloir where we enjoyed great soft snow conditions on more moderate terrain, eventually passing beneath the North Face of Hallet, and arriving at Emerald Lake. 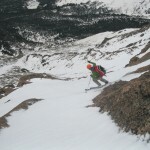 All in all, an awesome day in the hills, and hopefully the beginning of a great spring ski season. It has been quite a while since I posted anything on the blog. Mostly this is a result of too much rock climbing, and too little time up in the mountains. Hopefully that will change if we start getting into more spring like weather at some point. In the mean time, here is a video from a climb that Doug and I did a month or so ago on Otis Peak in Rocky Mountain National Park. 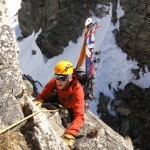 This route is considered by many to be a new classic, and I would readily agree. The route offers remarkably sustained climbing at a fairly moderate grade. Although originally reported as a grade IV, by linking a few pitches, it might be more of a III. 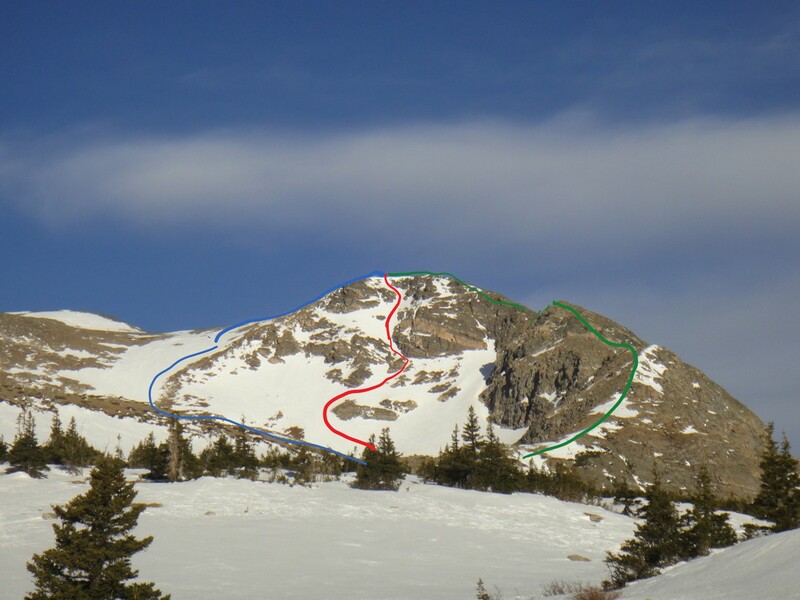 We originally intended to link this climb with some of the neighboring routes, but the forecast clouds never materialized, and by the time we reached the summit around noon, most of the other lines were running lots of water. This is definitely a climb I can imagine myself repeating over and over (as Doug did, climbing it twice in a week). 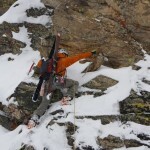 3) down climb the sketchy terrain, accepting the powder crashpad as a reasonable outcome. Luckily good judgment and luck won out, and the downclimb went off without issue. At the base, the route was nice enough to drop a few wet slides on to all of our gear. 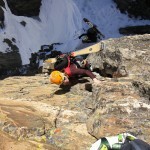 Did some bolted mixed climbing at Vail on Sunday with Joe, Doug and Jesse. Led Cupcake Corner, then we toproped Frigid Inseminator and 7th Tentacle, while Doug and Jesse climbed the much harder routes to the right. First “real” sport mixed (meaning actual rock and ice) leading I’ve done. I tried to move to the ice much too early, costing me the onsight. I did get pretty good at up and down climbing the chossy crux. Forced Joe to put up with a marathon belay session. As usual, another movie. Last weekend I decided to turn 30 and take a trip up to Cody, WY with Chris. Although the forecast was a little warm, we had faith that Cody would still deliver, and it did. 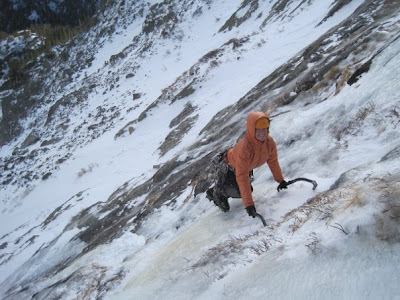 The combination of huge ice routes and minimal crowds make Cody one of the more appealing ice climbing destinations around. Also, the environment tends to lend itself to some fairly adventurous outings. After a brief and somewhat humorous run in with the law, we made it to our motel shortly after midnight. We got up the next day and climbed the mega classic Mean Green. It proved to be a pretty long day, with some hard (for us) climbing, a somewhat sketchy descent, and some route finding issues on the hike out. 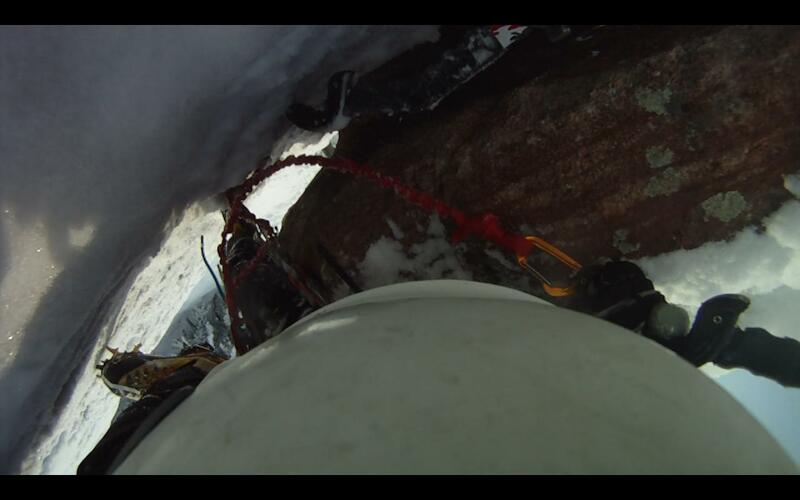 Nonetheless, it was probably the best ice climb I’ve ever done, so well worth the effort. We didnt get back to the motel until around 11:00, and after a microwave dinner, an early start the next day was basically out of the question. Instead we decided on a leisurely start, and a climb of Stringer. 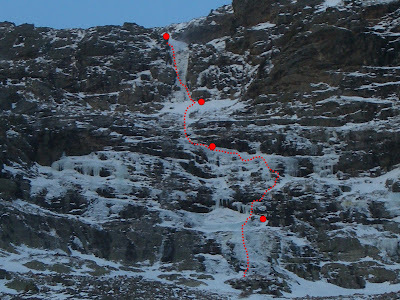 Although located in a dark cleft, the route is still on a south facing aspect. Unfortunately, the warm temps had melted out a significant portion of the climb. This was a bit of a mixed blessing, as we were pretty worn out from the day before. We spent the afternoon driving around and looking at various ice climbs, before returning to the motel for a nap and some BBQ dinner. Day 3 we hoped to climb the classic Moratorium on the lower bench. One of the longest continuous flows in the valley, and rarely as fat as this year, this seemed like an obvious objective. On the approach, we noticed the climb looking a lot harder and thinner than it had the day before, so we opted instead to head up to Bozo’s revenge. It turns out, the climb we were seeing on the approach was not actually moratorium, but Joy After Pain, a much more difficult line. Moratorium was out of view around the corner. Still, Bozo’s proved to offer some classic moderate climbing, with an excellent 50m long main pitch. 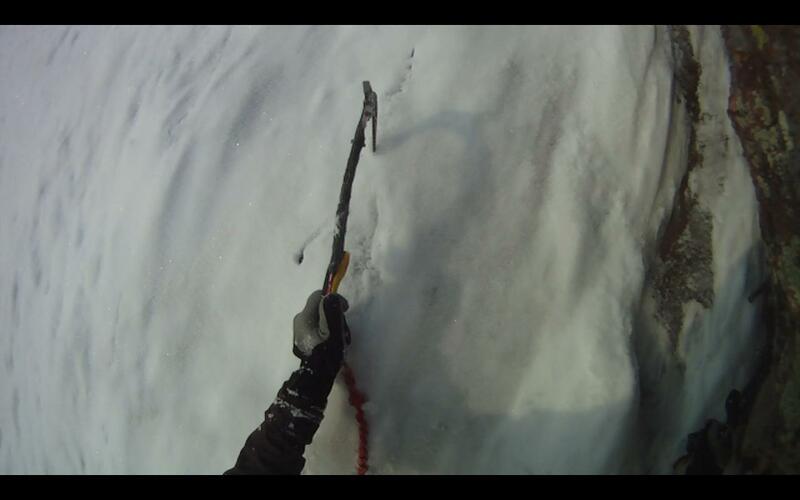 Chris and I got out for a great day of ice climbing on Saturday. We climbed the classic moderate Jaws in RMNP. In spite of the cold morning temperatures in Boulder, temps on the climb were pretty Balmy. Luckily, we were up and down early enough to keep things from falling down. Conditions on the climb were great, although more interesting and slightly harder than we anticipated. What looked like a kicked out groove from a distance proved to be steep complex dribbles, with slightly challenging protection. After basking in the sun for a bit after the climb, we headed back to Boulder for some t-shirt weather rock climbing in Eldorado canyon. For some reason old link stopped working after 28 seconds. Hopefully this is better. There is something to be said for doing an ice climb in plain view of your office. 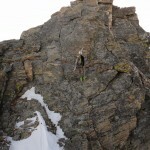 Although the upper route wasnt formed, we did climb some fun, and previously unreported, terrain. Reedited the video and uploaded to youtube, so it can be viewed in HD without going to facebook. Got out for a fine day of ice climbing yesterday with Joe and Becky. 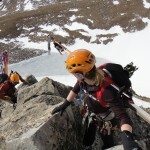 We headed up the RMNP classic All Mixed Up on the east face of Thatchtop. The usual 4AM departure had us hiking the glacier gorge trail around 5:15 AM. We made fast time on the well packed trail to Mills Lake, at which point we realized we maybe should have brought some better directions. Although the climb was in plain view, the approach is blocked by a fairly cliffy hillside. After a few misleading trails, we finally picked up the correct one. A nicely packed trail climbed steeply through the woods, before breaking out into the open and forcing us to break trail the rest of the way. 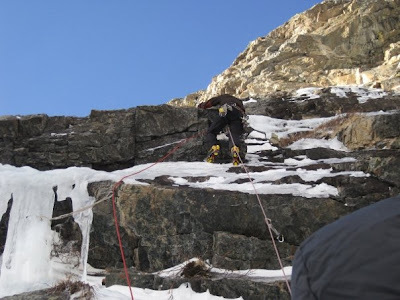 Apparently AMU can get very busy when fully formed, but today, in the present thin conditions, we were the first ones there (2 other parties would show up when we were on the 2nd pitch). After taking our time getting ready, we soloed up the first pitch of easier ice. The main flow ascended an extremely delicate looking pillar at the start of the 2nd pitch. We decided to climb around this by some still delicate, but shorter pillars on the right, leading to some thin ice and mixed climbing. Thankfully, the climbing was well protected, and the scariest part was the thought of dropping a tool. Above the mixed climbing, some beautiful ice lead up to a leftward traverse. An excellent 60m pitch of climbing. Becky led the third pitch which included more thin ice to a short column, more thin ice, and finally a snowfield to a stance below the final pitch. Joe got the classic final pitch. Grade 3 ice, made more serious by the constant spin drift, led to a tricky mixed slot, that luckily gave way to good ice and turf out right. After walking back to the base, Joe headed back up to look for a screw we dropped from the third pitch. Unfortunately, our screw was nowhere to be found, but Joe did find a screw belonging to one of the other parties that had started up below us. We returned it and headed back down to the car. When I moved to CO in April, I immediately became obsessed with perusing the internet looking for compelling climbs. One that caught my eye more that most others was the North Face (or NE, or E) of Notchtop in Rocky Mountain National Park. Unlike many of the climbs I came across, where the routes had an appearance straddling the line between alpine and cragging, this face looked distinctly alpine. 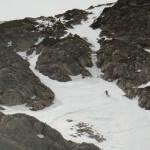 In spite of the modest grade (something like M-easy, WI3-4), the climb is apparently quite fickle as the same conditions needed to bring the climb in to shape can quickly lead to unacceptably high avalanche danger. Thus, the climbing season is supposedly quite short. Ever since the first glimmers of ice back in October, this climb has been near the top of my list. With the late october snow storm, and a few days of beautiful, warm weather it seemed like this past weekend was the perfect time to go check it out. Looking at the forecast, Chris and I didnt have the highest of hopes conditions wise. Temps in Boulder had been in the upper 70’s, and forecasted lows at 12k on Long’s peak were in the upper 40’s. Apparently I still have a lot to learn about CO weather, as conditions on Saturday were not at all Summery. Chris slept over at our house, and we set the alarms for 3:15 AM. We were out of Boulder a bit before 4:00, and at the parking lot by 5:00. The car thermometer was not looking promising. As we drove up to the trail head, the temperature rose with elevation to 46 F at the 9400′ parking lot. In spite of the balmy air temp, I was pleasantly surprised to find water ice in parking lot; perhaps this would work out after all. The approach was mostly a snow covered trail, that went by quickly. Soon, we arrived at lake Helene where we got a nice view of the face. Chris was skeptical that there would be any ice, but I was naively convinced that the white streaks in the steeper bands had to be ice. As we got closer, we saw quite a bit of ice in the surrounding basin. 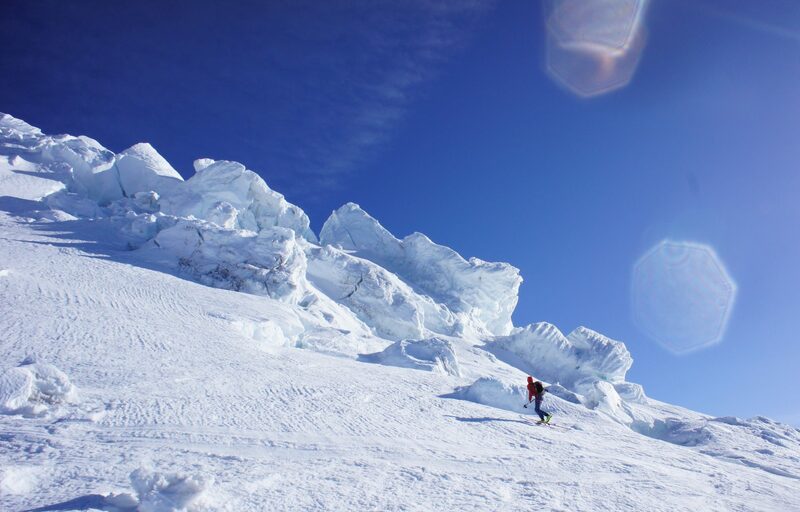 Even if conditions on the face conspired against us, it looked like we would at least be climbing some ice. We approached the face from the right side, unaware of the shortcut on the left side that would have saved time and elevation. Conditions leading up to the face ranged from nice compact snow to somewhat disconcerting wind slab. With the wind slab, we made a decision to mitigate some avalanche risk by using a running belay on the avy prone slopes leading to the first pitch. 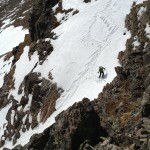 As luck would have it, chris ended up breaking trail for much of the wallowing on the route. The bottom of the crux pitch looked poorly formed, and we both though it might be easier to bypass it on mixed ground to the right. This variation started up a nice crack, before abruptly reaching a piton and old bail sling. This should have been a sign to turn around, but I slowly pushed upwards, finding one more pieve of barely adequate pro to allow some mixed moves on to sloping slabs. At this point, I couldn’t see an more accessible protection, so rather than risk a dangerous fall, I opted to reverse the moves and lower off the piton. Needing a bit of a break from the excitement, I asked Chris if he wouldn’t mind going to check out the proper ice start more closely. 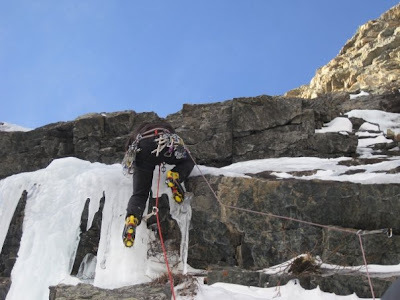 Using double ropes, Chris was able to clip a fixed anchor up and right of the ice (which would provide for a very uncomfortable swinging fall), then move down to the base of the narrow fragile pillars that blocked the easier ice above. Both pillars appeared to have a crack across their top, but apparently it had refrozen, as they still held weight. Chris tenuously worked his way up while I held my breath, until finally he was able to step left to a good stance and some good screws. From here, the ice was more straight forward, with a mix of rock and ice protection, before snow slopes gave way to a fixed belay anchor. The next pitch was a fun simul pitch up moderate snow and easy ice. Very enjoyable, if somewhat unremarkable. We stopped just below the gorgeous fully formed upper WI3 pitch, where I found a fine protected belay with a fixed piton and #2 camalot. Soon, Chris arrived, and he offered me the lead given that he had led the other noteworthy pitch. This was somewhat serendipitous for me, as I got to lead a classic pitch of WI, and it set Chris up for the long, deep wallow to the summit. The pitch turned out to offer 25 m of great ice. Steep enough for a calf pump, but not too hard given how early it is in the season. From the top of the ice, snow led to another rock anchor. From here, a long simul pitch through pretty arduous snow conditions, with a nice bit of turf and slab thrown in, led to the wild finishing ramp. The ramp looks improbable from below, but proves to be quite wide and secure. The final hurdle involves gaining enough purchase to pull over the lip and directly on to the flat summit. On top, we felt the full force of the wind that we had wpent the day protected from. It was not something I am really accustomed to, so it seemed pretty fun. Eventually though, the constant torque, as the wind blew against my pack, started to cause some back pain. The descent over to Flattop and down the Flattop trail seemed remarkably long, although it was scenic and we got to see a bunch of Ptarmigan’s sporting their winter feathers, and closer to the parking lot, the most spectacular CO sunset I’ve seen over Hallet Peak. That night, we turned in early planning to get up early the next day for some more RMNP ice. However, our laziness got the best of us and we went back to bed after the 4AM alarm. 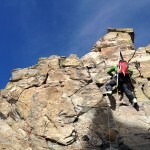 Instead choosing some mellow sport climbing in Boulder Canyon.